Thousands packed Cooper Park in Elgin for the display. 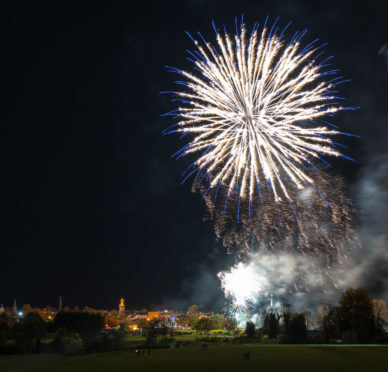 Thousands of people packed the centre of Elgin at the weekend for the town’s spectacular annual fireworks display. Large crowds lined the barriers around the huge bonfire in Cooper Park before the night sky was lit up with the pyrotechnic show. Yesterday, organisers from Elgin Rotary Club described the attendance for Saturday’s event as one of the biggest in recent years as the weather stayed calm for the evening. Bright purple bursts were commonplace throughout the display as a show of support for the group’s worldwide Purple for Polio campaign. Rotary clubs across the world are joining the cause to help eliminate the disease by spreading the colour purple, which is the type of dye used by medics to signal that somebody has been vaccinated. Out of the Darkness Theatre Company created the Guy, who was wrapped in a white cloak, to sit atop the bonfire to start the celebrations. Moray College UHI hospitality student Allan Higgins, from Elgin, was chosen to flick the switch to start the fireworks to mark the year of the young person in Scotland as well as care experience week. Meanwhile, youngsters from the New Elgin and Knockando Rotakids youth groups were also represented at the ceremony. Julie Williams, a member of Elgin Rotary Club, said the weather had helped to boost the size of the crowd. She said: “It really was a good evening. It was a big crowd, certainly a few thousand and the biggest one we have had for the last few years and the weather was certainly on our side for that. Meanwhile, large crowds were also out in force at Grant Park in Forres on Saturday where a movie-themed display was set to music for one of the largest displays ever seen in the town.